In just one year, researchers from the University of Copenhagen’s Department of Computer Science have developed an advanced customer service and support system built on artificial intelligence and provided it to several Danish companies. The project has just been awarded a one million kroner Grand Solutions grant from Innovation Fund Denmark. 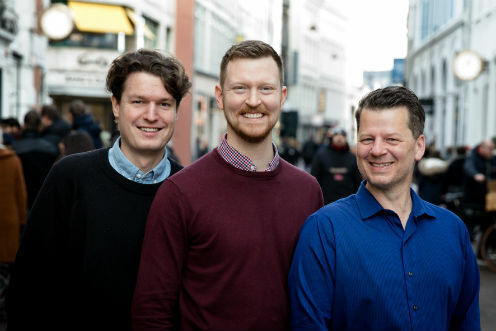 Researchers from the Department of Computer Science and tech startup SupWiz have just won first place and a one million kroner grant from Innovation Fund Denmark’s Grand Solutions programme. The computer scientists have developed an artificial intelligence (AI) driven customer service and support system built around what they call, "the world's best chatbot”. "What makes it the world's best chatbot is that it is deeply integrated within a company's systems. It can solve problems, understand user queries and ask follow-up questions, rather than spitting out generic FAQ style one-liners," explains computer scientist Søren Dahlgaard, who knows of no similarly robust customer support technology in Denmark or abroad. Besides assisting customers through written dialogue, the system can also lend a hand when human intelligence is needed, by quickly finding the right employee to resolve an issue and equipping them with the tools to do so. The core of the chatbot is an artificially intelligent language model developed to analyze an enormous number of common questions specific to a given companies’ customer service experience. The language model ensures that variously worded queries of the same subject matter are perceived identically by the computer. The result for end users is a far more accurate and rapidly resolved service experience, where customers needn’t repeat themselves or wait in long queues during times of heavy service traffic. The computer scientists have tapped Novo Nordisk IT, the Municipality of Copenhagen and One.com, among a number of other firms and public institutions, to serve as cases in the development of their customer service and support AI. One.com has been greatly impressed by the system. And, in a single year, the company has used it to help thousands of customers on a weekly basis. “The project has surpassed our expectations. The chatbot is intelligent and quick to hone in on a customer's needs. It can check servers, reset customer passwords and ensure that we are engaging with the legal proprietor of a domain," according to Mikkel Nedza, Customer Success Director at One.com. The company sells internet domains, hosts websites and provides email services for approximately one-million customers in 149 countries. One.com has experienced a clear optimization of their customer service during the past year of the research project. Along with its ability to resolve numerous simple tasks on its own, the chatbot can also be deployed to manage sudden spikes in customer service traffic. It is also able to screen cases, making them quicker to expedite. "In slightly more complex cases, the chatbot can identify preliminary issues before handing over the case to an agent, who is then better prepared to rapidly serve a customer’s needs," says Nedza. He points out that the best service results from a combination of the bot function and a live customer service agent. Each and every day, the customer service sector fields many different questions revolving around the same topics, formulated differently, with spelling errors and domain specific language. While one customer writes, 'I no longer want to be a customer’, another may write, 'I would like to cancel my subscription.’ Addressing linguistic variation has been a key nut to crack in the work to develop intelligent customer service. "Language varies greatly. We have created a solution that converts semantically similar formulations to numerically identical output. In other words, we have created an algorithm that translates human language to numbers that are readily understood by a computer," explains Søren Dahlgaard. The researchers have also focused on using artificial intelligence to address queries in a smarter way and accurately direct them through a complex organization. For the time being, the chatbot dialogues with customers in writing. But in the future, researchers hope to bless the bot with a voice so that it can communicate by phone.